It’s a known fact that most people prefer to use the drive-throughs when visiting their local bank or credit union. Just like grabbing dinner from your local fast food joint, people would rather wait in the comfort of their cars than in a cramped lobby. But, while they’re waiting, why not utilize your outdoor space? 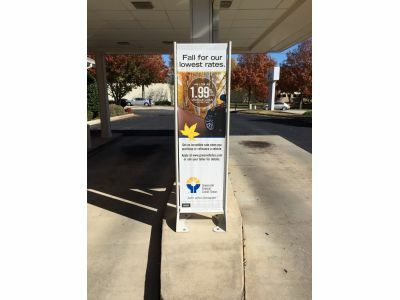 BannerFlex’s popular banner stand, the Messenger GMS, can be used to convey important information about your bank or credit union’s services, rates or policies. Now, with the addition of new size features, you can alternate your banner lengths, from 48” to 72”. The GMS banner stand can easily accommodate either size by simply adjusting its bottom bar. Why does your bank need this? Well, sometimes you just want a short, sweet message thanking your clients for choosing your establishment. Other times, you need to include more information or images... such as when you’re rolling out a new service. Additionally, if cost is a concern, you can save money by choosing the 48” banner, and then, down the road, you can upgrade to the 72” as funding becomes available. Naturally, this new feature isn’t just exciting for financial customers. Grocery stores, car dealerships, gas stations and restaurants can also take advantage of the Messenger GMS’ options. As always, thank you for your interest in BannerFlex products, if you need any additional information, please contact your sales representative.